From Las Vegas we begin our journey back east and our first stop? The Grand Canyon. Today, we cleaned up and ate lunch before we left our campground. We drove until dinner and then again until we reached our current destination, Williams, AZ. 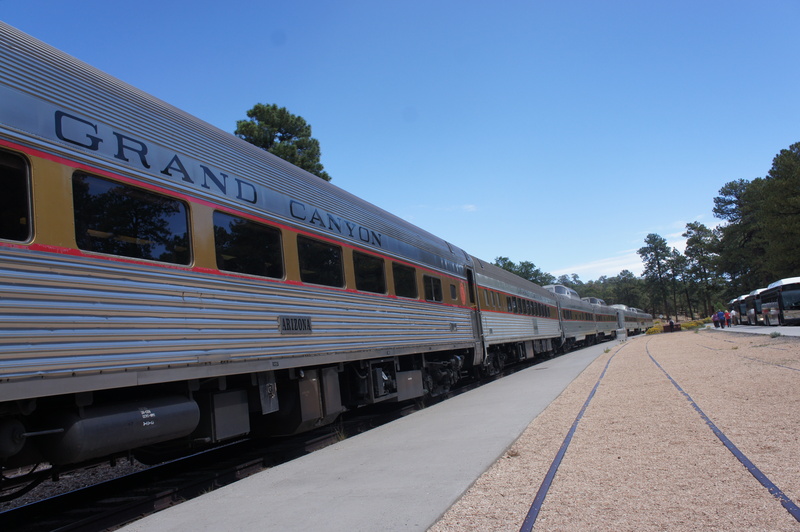 A railroad town, Williams is famous for the Grand Canyon Railway and our means to visit our nation’s biggest and most beautiful natural wonder. A quiet small town, home to about 3,000 people most working in one of the several hotels, motels or restaurants catering to the tourists. Williams is historically known for being the last town on Route 66. I-40 was built and opened around the town in 1984 and the world-famous Route 66 was decommissioned only the year after. I’m reminded of Radiator Springs in one of our favorite animated movies. Shops and businesses bypassed by the big bad interstate. Sad, isn’t it? Anyway, we got into Williams after dark and plugged into our campsite at the Grand Canyon Railway Campground. After the kids were tucked in, Darryl and I planned our attack on the canyon. With a early morning approaching, we were quick to follow the kids to dreamland. This morning was the first morning in a very long time that I woke up before my kids. I rubbed my eyes, nursed the baby and off I went to the ticketing office-it was about a mile walk that was kindly cut in half by the shuttle for the complex. I hopped off, bought some juice and coffee from the GCR Hotel Café and waited in the morning sun for the Train Depot to open up at 7:30. One of my favorite things about what we are doing is the people we meet. We’ve bumped into all kinds of people from all walks of life. Most look at us with crazy eyes when they learn what we’re doing but some tell us how beautiful our family is or that they admire us to be out here for so long with so many kids being that we are so young. Some tell us to use birth control and others hand each one of the kids a $2 bill. I also love to talk to people who say “I’m one of five girls and I loved it” It’s amazing that we can brighten someone’s day just by walking past them because they see love and beauty and innocence in our children. We take them back to years past in their own lives and put a smile on their face. As I waited, a gentleman was also standing at the doors and my ancient smart phone is still on Eastern time so to be sure I asked him what time it was. In his slow southern drawl he spoke “7:26” And I told him about my phone and the time change. Having been from the same time zone he asked where I lived and I told him. I reciprocated the friendly banter and he’s from Nashville. I was enthralled because Darryl and I had just discussed wanting to go to Nashville. He told me all about it and recommended some great spots. I love meeting new people! You’ll usually always get the best of strangers especially when they’re on vacation. Only, he wasn’t. We continued our friendly chat and I learned he was travelling alone. See, he’s a bus driver- a tour bus driver and while the Zach Brown Band finish up two shows in Atlanta before flying to California he has an empty bus and some free time to fulfill a dream of his, to see the Grand Canyon. We packed lunch, snacks and a lot of cold water. Grabbed the diapers and a couple of strollers, then got the crew back up to the depot for the wild west shootout just feet from where we board the train. At 9:30 we were leaving the station and on our way to the Grand Canyon. The two-hour ride was enjoyable with the scenery and western performers passing through the cars. Juniper even got to help with the fiddle. We were prepared with our snacks and books to keep the kids busy but they did pretty well just looking out the window. When we reached the end of our 65 mile ride we thought we had a good plan of action for the four hours until our return train home but the visit proved to be nothing more than a quick stop in a visitor’s center for our JR booklets and about 10 minutes at Powell Point, one of the gorgeous viewpoints from the south rim. The other 3 hours and 20 minutes was spent shuffling on and off shuttle buses folding and unfolding strollers and waiting for the next ride because the first one or two were full. In fact, waiting for our first shuttle cut 30 minutes off our already short day and we spent it just sitting around. The shuttles come every 10-15 minutes and it’s a sense of urgency radiating from the crowd of tourists who think nothing of trampling past my two-year old to make it aboard the bus as if it’s the last bus and their last chance to see anything; ever. I digress. We waited and waited and the third bus was the charm. We rode to the transfer to get on another bus to travel the Hermit’s Rest route and again had to let the first shuttle pass by. We arrived to Powell Point about an hour after arriving in the park. We sat and looked out over this cavernous masterpiece while we ate lunch. 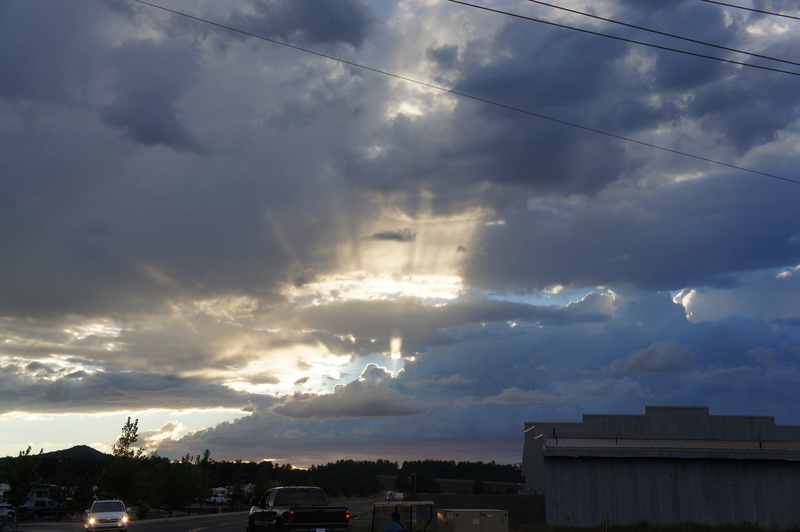 Storm clouds loomed in the distance and before long we heard and saw thunder and lightning. So, we started to walk back to the shuttle stop. Another hour passed before we made it to the Canyon Visitor’s Center where everyone used the restroom, Dogwood ate and we found out we had to attend a ranger’s program to earn our badges. But we only had one hour left to catch our train or be stranded here. We could walk the 65 miles back home or take a $165.00 taxi ride or just sleep in the woods without a permit and be fined for doing so. We cut our losses , shuttled back to the train depot and decided to come back up the next day in our RV and get to do all we wanted to while we’re here. Our train ride home was a little less enjoyable. We ate what was left of our snacks and left our tummies grumbling. Oak was sleepy and our cars’ attendee’s jokes were getting old. The fun wasn’t far down the track, though. The shootout gang came aboard for an old-fashioned train robbery. As the actors perused the aisle some passengers handing them dollar bills most taking pictures. My kids? So, he comes to her, she smiles reaches in our snack bag and pulls out the peel. The entire car is in stitches. And now our tears of fright have turned to tears from hysterical, uncontrollable laughter. Crisis averted! When we got back to Williams, Lemon couldn’t stop laughing and talking about the banana peel-but we managed to play at the park for a bit while Papa Bear picked up Oliver from the kennel and went home for dinner. Bellies full, we showered and went to bed with the sun after a long day exploring the Grand Canyon’s shuttle buses. I went to the Grand Canyon when I was about 14 and I would LOVE to go back as an adult. Its so beautiful – definitely something everyone should see at least once in their lives!